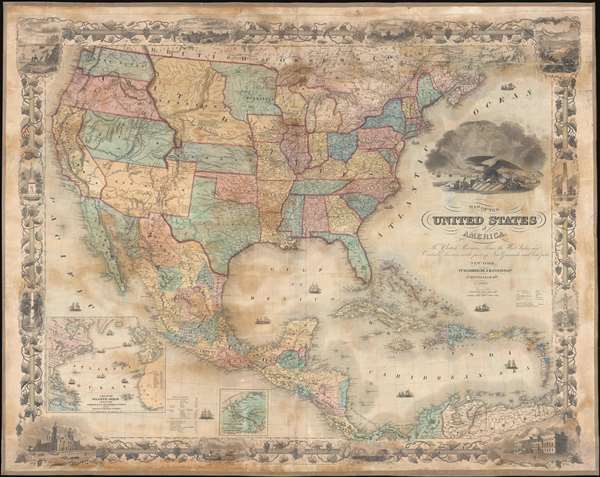 An exceptionally beautiful map of considerable historic importance, this is J. H. Colton's 1855 map of the United States. The map's coverage extends from Canada to Colombia, inclusive of all of the United States, Mexico, Central America, and the West Indies. It is surrounded by an elaborate grape vine themed decorative border engraved by Bernard. The map itself was engraved by Atwood, and is full of fascinating detail relating to the westward migration and early territorial development of the Transmississippi. The map is most interesting for its ephemeral delineation of the lands to the west of the Mississippi Valley, where vast new territories acquired at the end of the Mexican American War were rapidly being consolidated into the United States. The publication of this map immediately follows the 1854 Kansas-Nebraska Act, which defined the Kansas Territory and created a new Nebraska Territory extending to border with British America (Canada). Although California, enriched by the 1849 Gold Rush, was already a state, the lands between California and the Rocky Mountains are presented along territorial boundaries. Neither Nevada nor Arizona were yet conceived of. Utah extends from California to Kansas and has its capitol at Fillmore City, although this would soon change to Mormon capital at Salt Lake City. Similarly, Washington and Oregon incorporate vast swaths of land extending form the Pacific to Nebraska. Colton has also notes several routes related to the American Westward Migration. These include the Oregon Trail, with distance notations from Westport Landing, Missouri. The Santa Fe Route, also running from Westport Landing, appears further south. In addition to migrant routes, the map also details military routes, including those taken by General Kearney in 1846, John C. Fremont, and General Wool, among others. Throughout land granted to indigenous American Indian Nations are meticulously noted. Colton first issued this map in 1849. Another edition followed later in 1849 in anticipation of the Compromise of 1850 and including updates relating to the explorations of Fremont and the discovery of Gold at Sutter's Mill. Subsequent editions were prepared annually until about 1859. The present examples is the 6th edition. The present edition is laid down on linen in wall map format and is accompanied by its original rollers. Good. Full professional restoration. Some offsetting and damage along bottom margin. Stabilized. Rumsey 5535.001 (2nd edition) Boston Public Library, Leventhal Center, G3300 1849 .C65. New York Public Library, Map Div. 01-5133. OCLC : 82726316.